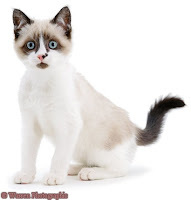 Snowshoe is a domestic shorthair feline breed. It is a very pretty cat with striking white toes and pointed appearance. The cat is an artificial breed that was created through crossing of domestic shorthair cats with Siamese in nineteen sixty in United States. The resulting babies with white mittens instantly appealed to the owner who began development of the Snowshoe in earnest. With time acceptance came for the felid in a number of cat fancies though it still lacks universal recognition. It is hard to predict the precise appearance of Snowshoes in a litter since apart from some characteristic features of the breed since they all differ in their individual colors and patterns. Snowshoes are elegant like the Siamese and yet are sturdy like the domestic shorthairs. They have a longish muscular body that is said to contain surprising strength for their size. Head is wedge shaped with oval blue eyes and medium sized ears with slightly rounded tips. Coat varies in individual pattern in nearly all Snowshoes but generally has white patches on chest, face and stomach. There is an inverted white colored 'V' on face as well. Points occur on face, ears, tail and sometimes legs in blue, chocolate, fawn, lilac, lynx and seal colors. Hallmark of Snowshoes are their pretty white toes that often contrast with darker markings on legs and give the cat its unique appearance. Paw pads are frequently light colored too but darken with age. The cats appearing in shows at times have quite remarkable markings, though they are very difficult to produce. 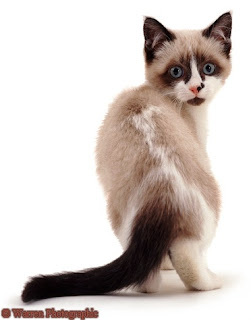 Snowshoes have a very boisterous personality and they are always looking to play and have fun. Extroverts by nature, they quickly attach themselves to all family members though they stay closest to one particular person. They go along very well with other cats and children and are always looking to interact with others. Like their ancestor Siamese, they are not shy to vocalize and communicate with humans. However, they have a softer voice. Even as each individual cat is different, Snowshoes are reputed to not get startled easily and maintain their composure and confidence in unfamiliar surroundings. Overall, these cats are very energetic and friendly companions who are quite affectionate towards humans and other pets. nice absolutely amazing http://123essay.org/essaylab-org-review/ blog. This is extremely nice and the cats are too cute to not notice!